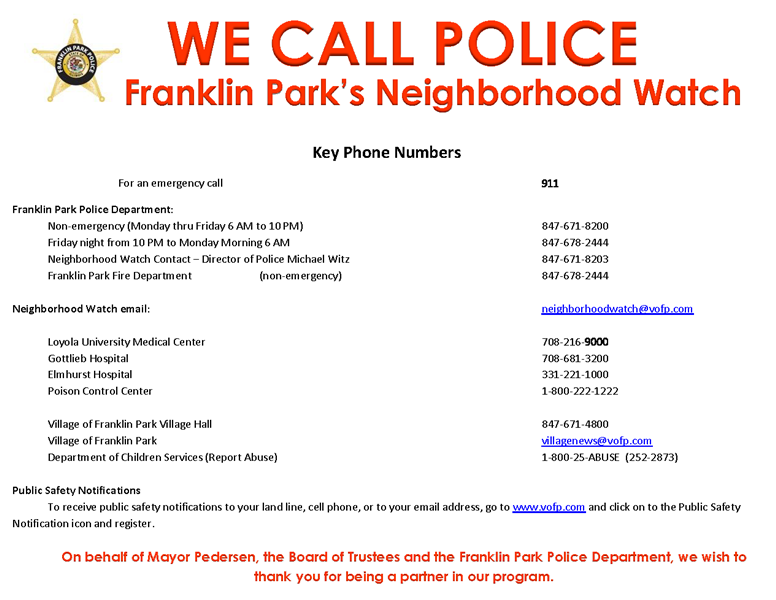 The Village of Franklin Park has instituted a new public safety notification call system that allows Village officials to reach thousands of contacts with detailed messages within minutes. This system also allows us to telephone all contacts or only targeted areas of the Village in case of an emergency situation that requires immediate action to help ensure life safety (such as a boil-water notice, missing child, utility outages, chemical spills or evacuation notices). To provide this service, the Village has contracted with Global Connect. Global Connect is a leading provider of web-based voice messaging, giving us unsurpassed calling speed and capacity without any capital outlay. The system is web-based, so there are no set-up fees, no expensive hardware or software to buy, no maintenance costs, no minimum usage requirements, no training or service fees, and no recording costs to the Village. Voice messaging campaigns can be conducted at any time, from any location - using only a telephone or a web-enabled computer. This service and support from Global Connect is available 24 hours a day, 7 days a week, 365 a year to the Village. If your phone number is not in the database, you will not be called. No one's phone number is automatically included. It gives individuals and businesses the ability to add their own phone numbers directly to the system's telephone database. All businesses should register, as well as all individuals who have unlisted phone numbers, who have changed their phone number or address within the last year, and who use a cellular phone as their primary home phone. To ensure no one is omitted, we urge all individuals and businesses to complete the registration form below on this page. Those without Internet access may call the Franklin Park Police Department at (847) 671-8200, Monday through Friday, (8:00am - 3:00pm) to give their information over the phone. Required information includes first and last name, street address (physical address, no P.O. boxes), city, state, zip code, primary phone number. Optional information that can include additional phone numbers (cell phones) and email address.